For the time being, this is available as a 12-incher with a cute picture sleeve, T-shirt offer, green stamps, chance to win a three-year subscription to New Society and all manner of special ised weirdness like that, but I'm reviewing this off a plain old seven-incher and it still sounds sufficiently monstrous. Monstrously charming, that is. "Sheena Is A Punk Rocker" is a heart-warming love song with references to surfboards and discotheques and it's got harmonies and a chorus and. . . and . . . look, all the Ramones songs sound like hit singles and then don't sell, but this song is so flat-out delight ful that not even the nasty boring dull-as-bleedin' ditch-water Britpublic will be able to resist it. The sheer charm and essential niceness of Dolly Ramone's four horrible sons is gonna win out. And even if it doesn't, there's always the double B-side of "Commando" (from the last album) and "I Don't Care" (never previously released) to cop the sympathy vote. Me, I like "I Don't Care" because of the beautifully soulful way in which Joey Ramone lists all the various things that he doesn't care about. "Heartwarming"just isn't the word, though I haven't the faintest idea what is. Lead singer Joey Ramone celebrates his Birthday today, he was born in Forest Hill, New York in 1952. BACK IN the archives and annals of rock and roll history, we recall with some revulsion four other boys who once played the dives of Liverpool with long fringes dancing a frenzied tarantella on their eyelashes. Real apt that these new improved moptops should choose to play Liverpool; after all isn't this what Brian's boys might have been like had he hit them over the had with a sledgehammer seven times daily as opposed to holding their hands? Joey Ramone is much more of a Beatle than Lennon ever was. However, worse things first. I was surprised at how empty Eric's was. And those present were definitely not the breed detected at London new music gigs; I saw just one girl in rubber. Otherwise flares were the order of the day - but a Bored Teenager is a Bored Teenager no matter the diameter of his trousers and when 'Anarchy In The UK' blasted out it was the red light to the lemmings. See them jump! "/ use the eNeMeE!" sneered Johnny and I cursed in silent agreement as the ninety-sixth pogoer came to momentary rest on my gold-strap clad foot (What, no nail varnish details this week, Julie? - Ed). I need holes in my feet like Britain needs Talking Heads. Suddenly my homicidal contemplations are swept aside. Oh No! Oh Yes It's them! Democracy, fair play and team spirit fall useless by the wayside as The Ramones take the stage. I have to look into Joey's eyes! Getting to the stage is all I know. Anything to get to the front; I stuck my stiletto heel into so many groins it brought tears to my eyes. And they fought back; I got cigarette burns on my feet and sapphire and emerald bruises on my arm to prove it. But true love conquers all, and here I am at last, clutching the barrier at Johnny's feet! 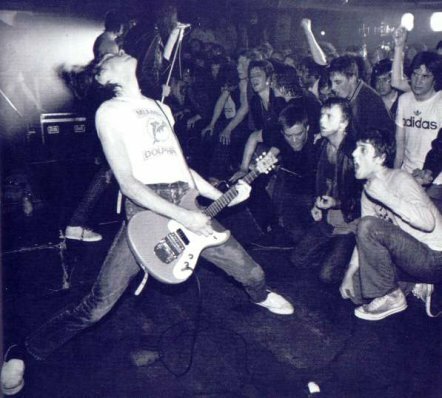 Everyone had warned me how much the forcible assimilation into The Ramones world of decapitating decibels would hurt, but I was oblivious. It sounded great to me; practically everything from the two albums plus 'Sheena Is A Punk Rocker'. The words are totally indecipherable but so what? This ain't a Wittgenstein tutorial, this is rock and roll. Who needs sense when you've got Esperanto? "Joey!" I yell. As if by the kiss of kismet, Joey enunciates: "Dere's a lotta special gales out dere tonight! Dis is for alia choo!" Ooo! It's 'I Wanna Be Your Boyfriend'. I clutch the fragile barrier as one of my ribs gives way and the barrier collapses. Quick as greased lightning the security rushes forward to replace it; no heavy handedness, no abuse, and as far as I can see the kids in the frontlines are helping to haul the barricades back up. "Gabba gabba" is the watch word and for 'Pinhead' Joey brings on a sign stamped with those words. We accept you, one of us - we're freaks too. From the constant catcalls of "Suzy" and "Headbanger!" one can only presume that a considerable number of Liverpudlians are at present being headbanged by a considerable number of Suzys. In one last death-defying act I balance myself on the again-falling barricade, and with one fell swoop my trembling eager fingers close around a slender white appendage. Johnny Ramone's plectrum is mine at last. Limp survivor of three encores, I lean shell-shocked against the wall and find it's the only thing sweating more than I am. Ramones - you can never go home.